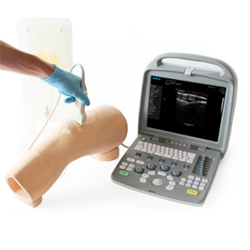 Limbs & Things develops a new Knee Training Model for Joint Injection and Aspiration using Ultrasound Technology. Limbs & Things has always embraced new technology and with advances in synthetic soft tissue materials, the R&D team have re-developed a number of key products to incorporate this new technology. The latest edition, the new Knee Aspiration & Injection Trainer with Ultrasound Capabilities, embraces state-of-the-art silicones and gels to provide an anatomically accurate representation of an adult right knee, both in terms of surface feel and underlying structures of ligaments, bone, muscle and fat. Therapeutic procedures such as arthrocentesis and joint injections can be practiced in a safe environment away from the patient allowing for repeated needle insertion on both the lateral and medial sides of the knee. A key advancement in this product is that an echolucent material has been used to enable the use of ultrasound-guidance, as well as the more traditional blind technique. “The development of the product demanded an innovative combination of materials, to ensure lifelike feel and the ability to ultrasound. The internal structure is anatomically accurate and is robust enough to withstand an impressively high volume of injections over several sites" said Catherine Sulzmann, Research and Development at Limbs & Things. The Knee Trainer is available to buy via the Limbs & Things Website or directly with the offices in US, UK and Australia.